The membership of Philadelphia Country Club, which had reached a record high of 1,349 at the end of 1928, dropped to nearly half that in the Great Depression, then sank even lower under the impact of the War. At the end of 1943. the roster showed 638 names. The club contributed to the war effort in a number of ways: allowing the U.S. Army Corps of Engineers to use the Spring Mill course ("exclusive of greens") in order to test the discoloration of grass through chemical treatment for camouflage; collecting some five tons of old scrap metal from the club grounds (exclusive of bridges! ); and entertaining wounded veterans. The servicemen had the opportunity to enjoy a broad range of activities—golf, swimming, bowling on the green, croquet, badminton, tennis, basketball, baseball—followed by dinner, dancing, and a floor show. Only beer and soft drinks were served, no liquor. This circumstance was the source of two memorable directives to the hosts and hostesses from the club’s War Activities Committee: "(1) Please do not boost your morale with a hard drink while waiting for the boys to arrive. The aroma may linger. (2) If, during the evening, you see any group of boys overindulging in beer and they ask you to take and refill their pitcher, take it, but do not return." Harold (Jug) McSpaden was head golf professional at the Country Club during World War II, though the club granted him extensive leaves of absence to take part in exhibition matches with Byron Nelson for the benefit of war bond sales, the Red Cross, the USO, as well as in what PGA Tour tournaments were being conducted. Art Morrow’s column in the Philadelphia Inquirer, April 28, 1944. quotes McSpaden: "The tour, I feel, not only will help the war effort, but also will stimulate interest in golf .... Some of our best friends in service—Ben Hogan, Jimmy Demaret, Sam Snead, Jimmy Thomson, Lawson Little, Paul Runyan, Horton Smith—have asked us to play as much as we can in order to keep the game going for them." Nelson and McSpaden, who would come to be called the Gold Dust Twins because of their tournament winnings, were only too willing to oblige. 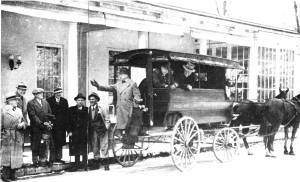 At Phildelphia Country Club a pair of horses and an old wagon were pressed into service so that golfers could get back and forth to public transportation while the ban on pleasure driving persisted. V-J Day found Philadelphia Country Club, like Merion, deeply in debt. The mortgage on the two properties, Bala and Spring Mill, was $590,000. Payments had not been paid on the principal, and overdue interest amounted to $70,000. Approximately $200,000 was now raised from the membership. It was used to pay the delinquent and current interest and to make improvements to the properties that had been precluded by the war. On Oct. 19,1991, as the culmination of its year-long 100th Anniversary celebration, Philadelphia Country Club opened a third nine holes. What especially prompted interest in it was the identity of its architect: Tom Fazio. 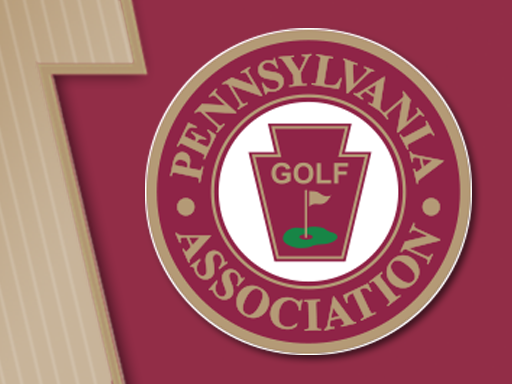 Born in Norristown, Pa. in 1945, Thomas Joseph Fazio entered the world of golf course architecture at the age of 17, when he joined his uncle, George Fazio, in course construction. He got a thorough apprenticeship that included design, engineering, soil analysis, and construction, not to mention the business side of the trade as well. Among the local courses the young fellow worked on, essentially by the sweat of his brow, were Kimberton, Waynesborough, and Moselem Springs. The 5th on the Centennial Nine, a par 3 of 155 yards. 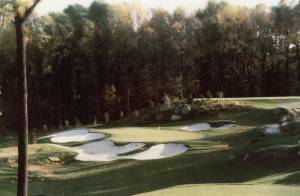 Like all of Fazio’s work, it is endowed with aesthetic charm, fairness, and playability. And if it blazes few trails, it nevertheless offers a number of solidly testing holes and two that are particularly distinctive. The 4th is a 520-yard double dogleg that plays from an elevated tee down to a generous landing area marked, on opposite sides of the fairway, by two sentinel trees, a massive oak and a graceful ash. The second shot is uphill, with out of bounds left and a rough-covered ridge on the right. The green, angled diagonally to the fairway, sits shelf-like atop a rise and is defended principally by a very large bunker on the right. This snares many an ambitious second shot and leaves the player with the unappetizing prospect of a long—and uphill—sand shot to a green whose surface he may not be able to see. The 8th is rather the opposite of the 4th. Instead of a climbing par 5, here we have a falling par 3. It is 225 yards long; the green, tilting left to right, is bunkered on both sides; and the shot must thread its way fully 200 yards through trees on both sides before it finally clears their clutches and can now seek the haven of the green. The Centennial Nine can be played at 3,315 yards, 3,100 yards, and 2,770 yards. Early on, the club considered integrating it with nine holes of the William Flynn eighteen, but that did not turn out to be quite satisfactory. By and large, it stands on its own feet and is only infrequently used in conjunction with holes from the original course. In high season, or on days when the club is hosting a competition, the Centennial Nine is a godsend.